Before the recent event from Apple I was waiting for the announcement of new iPhone OS so I could upgrade and get all the new features. Unfortunately, there was no update as of yet. So, I decided to rejailbreak my iPhone. I’ve been missing push notifications from my last jailbreak and wanted to go a different route. Before I restore my iPhone I sync my iPhone and then use SSH to backup all kinds of stuff. Here’s the process I use. Some are redundant because the iTunes sync backs them up but many times I’ve had a bad backup or want to start fresh and if you don’t back up everything, you will lose it. If you can think of anything else, please add it in the comments and I’ll add it to the list. 1. Sync with iTunes. This will save all of your App Store & stock app information like notes, game saves, logins, etc. Again, if you are not going to restore from this backup then you don’t need to do this. 2. Remove all pictures and videos using the USB connections. If something has happened where you can’t access your iPhone via USB to see pictures, like me right now. You can go to /private/var/mobile/Media/DCIM/ and manually download them via SSH. Beware, if you have a lot of pictures and videos, it may take a while. 3. Take a screenshot of every page of your springboard. I also take them of Winterboard and my Settings app where the jailbroken apps list is. 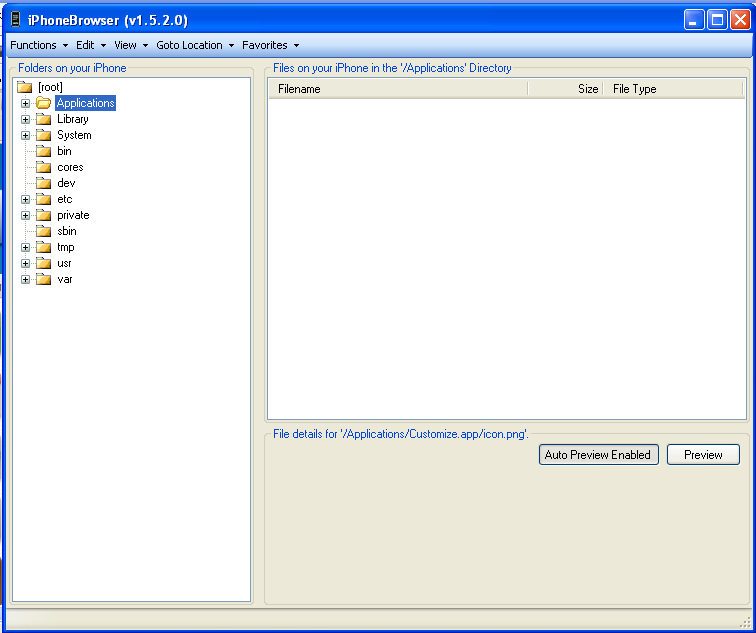 I just ran across this really great tool…it allows you to view the folder and files on your iPhone/iPod Touch using an application on your computer called iPhoneBrowser (sorry Mac users, it is PC only). The nice thing about this application is that it is easier to set up than SSH and your iPhone doesn’t even need to be jailbroke in order to use it! Though, if your iPhone is not jailbroke, you will not be able to see many of the folders because Apple restricts the access. If you would like to learn more about jailbreaking your iPhone, please see our Jailbreak page.